Established in 2006, Warwick Institute of Australia (WIA) is comprehensive modern business and IT college located in the heart of Sydney CBD, Australia. We offer a range of nationally recognised vocational qualification in the fields of Software Development (IT), Marketing Management, Project Management, Business and Leadership Training. Our course content and structures are regularly reviewed by our academic board and industry consultants to ensure that the curriculum meets the rapidly evolving demand of the marketplace. The quality training we offer at WIA will be sure to help you achieve solid expertise in your field of study, with guaranteed pathways (with advanced credit standing) into degrees offered at Australian universities. 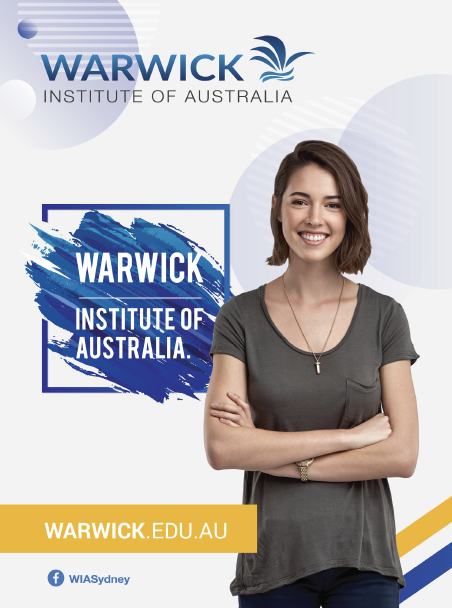 Warwick Institute of Australia Pty Ltd trading as Warwick Institute of Australia is a Registered Training Organisation (RTO) providing quality training in Information Technology, Marketing, Management, Business and English with National Provider No: 91270 and CRICOS Code: 02800G. Warwick Institute of Australia training programs comply with the Australian Quality Framework. Great student support with multicultural environment to support your learning process.